We have seen a 7% increase in gift aided income since 2014. In 2016 we generated an additional £10,306 in Gift Aid Tax relief. Instead of looking for cash every Sunday morning why not set up a bank DD to be paid monthly and fill in the gift aid form at the same time? A full financial report will be given this Wednesday 5th July at 7.30pm at the Parish Forum. 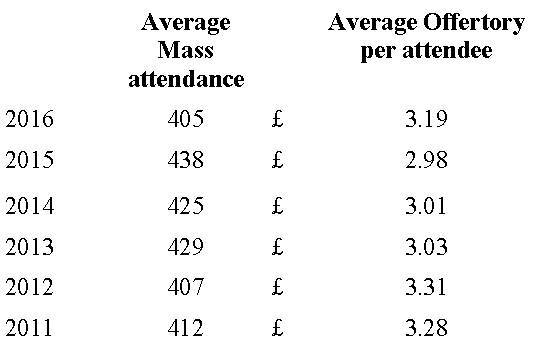 Mass attendance has remained static over the last 6 years and so has the mass offertory. Unfortunately church running costs have increased and so we all need to look at different ways of increasing church income.